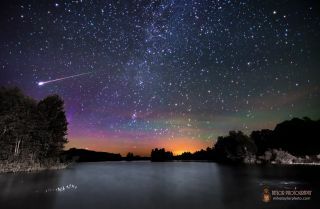 Mike Taylor captured this image of the Milky Way, green airglow, aurora borealis and the blazing tail of a meteor over Branch Pond, Maine on June 10, 2013. Science is for sharing: Scientists and science communicators have an obligation to spread their knowledge to as many audiences as possible. That process already involves a major translation, from the math and jargon-infused language of scientific inquiry to plain ol' workaday English (or to the language of your choice). In that translation, we rely heavily on visual descriptions, especially in astronomy, which is such a visual-based science. How many times do we describe the sight of an accretion disk around a distant black hole, or the fantastic fireworks of a supernova explosion? How many plots, graphs and images dot our discourse and punctuate our presentations? A lot. Although there are many great resources already available online, what follows is my attempt to create a guide to the night sky and astronomy using only tactual metaphors, rather than descriptions of images. Let's start with the sky itself: a vast upended bowl, a dome that appears to have all the heavenly objects simply placed upon it. It seems as if the "top" of the dome, sitting directly above us, is closer than the edges of the bowl at the horizons, but it's not true. Everything in space is ridiculously far away, and we cannot distinguish "close" from "far" without careful astronomical measurement. That sense of depth is apparent within the dome itself. The blackness of space is like an impossibly smooth fabric, with no wrinkles, features or creases. Its smoothness also hints at its depth; it simply feels like there are layers upon layers precariously suspended above us, imbued with both immense weight and incomprehensible lightness. About 3,000 stars can be perceived without a telescope's assistance in each hemisphere, and they stand in extreme contrast to the black depth of empty space. They are incredibly thin needles poking through the otherwise featureless fabric of the sky, like pins in a pincushion. Each is sharp and distinct, and if you could rest your hand on them, you would feel them vibrating, twinkling as their starlight passes through the turbulent layers of our atmosphere. The moon itself appears to be made of the most smoothly polished marble you could ever touch, and its appearance varies throughout each month, from a full disk to the smallest hint of a curved blade. Away from city lights, the splash of the Milky Way is spellbinding. As the galaxy stretches from one horizon to the other, its name perfectly captures its essence, as if a giant jug of milk had been upended and left to flow across the heavens. The night sky is beautiful to experience, full of interesting textures and powerful contrasts. But the operation of a telescope completely changes its character; small things become large things, and tiny differences become huge differences. With that level of detail, surprises await. With a telescope, the apparent nature of the moon perhaps changes the most. Indeed, Galileo Galilei observed that instead of being made of polished, smooth marble, the surface of the moon appeared to be composed of crumbled rocks — large boulders, small stones, gravel and dust. I can imagine running my hands over the surface and feeling a texture like papier-mâché. Nebulas, faint wisps of barely-there silk to the unaided senses, blossom into full glory, the telescope revealing layer upon layer of luxurious lace and effervescent fabrics. Imagine curtains billowing in the wind, a frozen moment of movement and dynamism. Training a telescope on the Milky Way exposes its true character. Instead of the creamy, fluid texture you might expect, we find millions — even billions — of stars, tiny pinpricks so far and so faint that, without our instruments, they blur together. Imagine sensing the motions and movement of individual molecules in a puddle of spilled milk. The telescope reveals the true and awesome depth of the night sky. The unaided senses perceive only unremarkable expanses of nothing, but by examining more closely, with more detail and clarity, we are able to explore the complexity, depth and hidden beauty of the cosmos. Learn more by listening to the episode "How to communicate astronomy to the blind?" on the Ask A Spaceman podcast, available on iTunes and on the Web at http://www.askaspaceman.com. Thanks to Tom for the questions that led to this piece! Ask your own question on Twitter using #AskASpaceman or by following Paul@PaulMattSutter and facebook.com/PaulMattSutter.